BIMINI BIG GAME CLUB SAVED ... and transformed! Passing into the entrance to Bimini Sound as a summer squall skates across the Straits of Florida to the west. All that blue water! 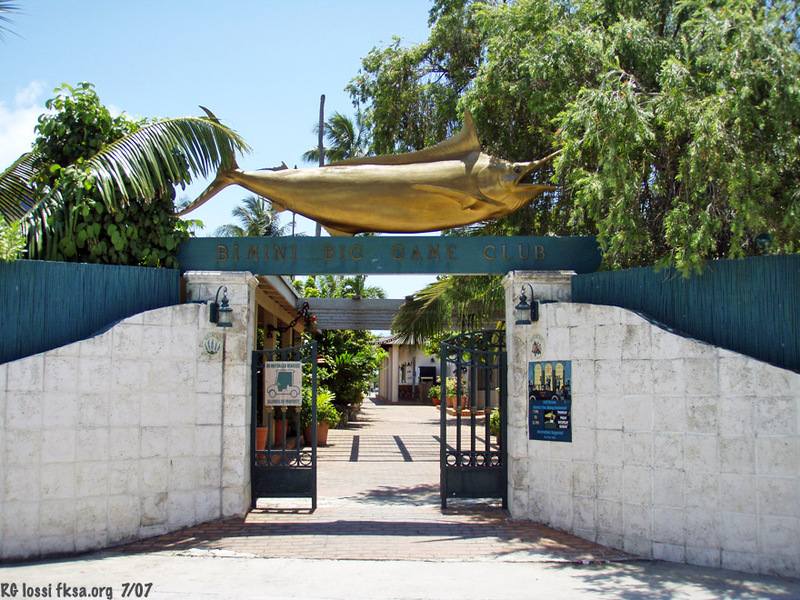 The Bimini Big Game Club has been an institution in Alice Town, Bimini in the Bahamas since 1936. It was a sad thing to see it closed a couple of years back. In the weak economy and with Bailey Town, Bimini Bay and South Bimini development going bonkers, it seemed unlikely that anyone would bailout this classic landmark. World famous artist, Guy Harvey did just that and in style from what news is coming across. The Big Game Is On! 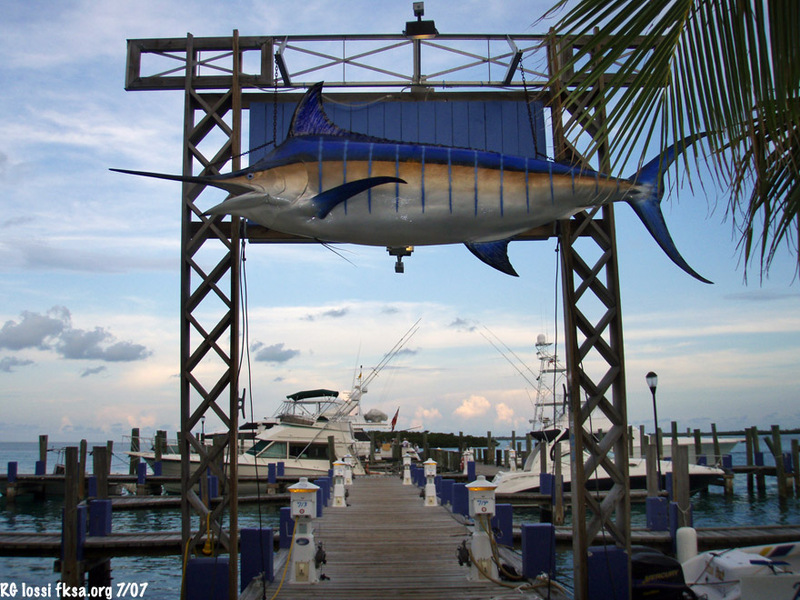 Memorial Day, 2010 marked the reopening of the legendary Bimini Big Game Club as a Guy Harvey Outpost Resort. Fifty one rooms and cottages, seventy five slips, Historic Alice Town and Bimini outside the front gate. Fifty miles east of Miami, perched at the edge of the mighty Gulfstream. Under brilliant blue skies, with the dazzling “Bimini blue” water as a backdrop, the opening was a picture perfect start to the launch of the new Guy Harvey Outpost system." Some photos from my last visit in 2007 a year before Big Game closed. "The Guy Harvey Outpost system has been created for adventure travelers and water sport enthusiasts who share Guy’s vision of respecting the oceans, land and cultures that together create the fabric of our blue planet. Unfortunately, we’re all too aware that the popularity of water-sports activities has increasingly pressured all theaters of marine biodiversity. Fortunately, the sportsman’s passion for his pursuits has brought, in fact, deepening appreciation for the stewardship each of us has in protecting the marine environment for current and future generations. That is the core mission of Guy Harvey Outpost–to create a memorable vacation experience for the entire family, and ensure each guest goes home with a greater appreciation of marine education and conservation." 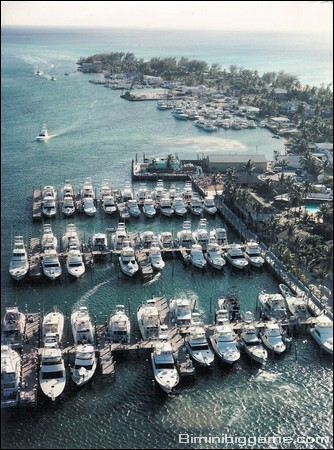 "This summer the Bimini Big Game Club, a Guy Harvey Outpost Resort & Marina takes center stage in the South Florida boating/fishing community, as it reopens after having been closed for two years. With the support of a private Los Angeles based investor, the property has been reconstructed and improved with new guestrooms, marina slips, the all new Bimini Big Game Bar & Grill (we call it the BGBG) and the stunning new Outfitter Shop, featuring Guy Harvey sportswear and a full complement of boating supplies and gear. Always at the top of every diver’s Top-10 list, Bimini sits perched on a 2,000 ft. underwater cliff, just two miles from the docks. The Club’s full service dive shop will open in July, and the Club is excited to announce that scuba-dive legend Neal Watson has joined the Outpost team to ensure the best-in-class recreational diving service and programs." "If you’re in or headed to South Florida or the Bahamas anytime soon, be sure to visit us. Mark the weekend of July 24th for our grand reopening party. Regardless, make a point to check in at the Bimini Big Game Club, and check us out. 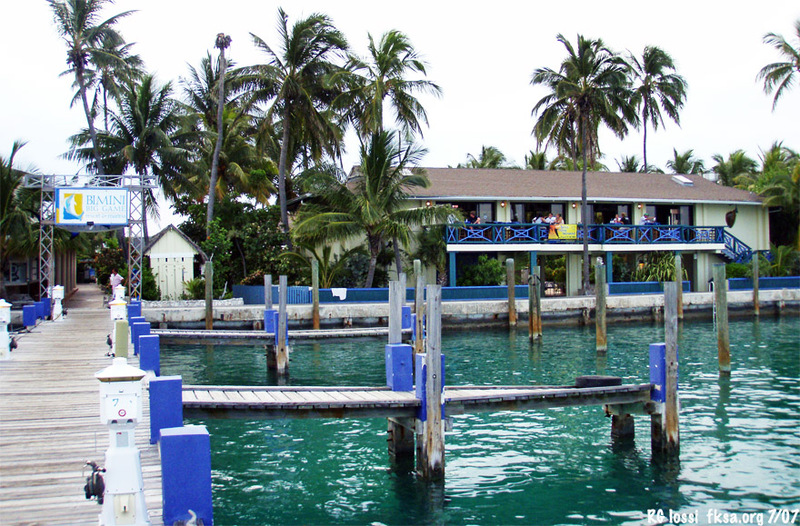 Help us write a new chapter in the history of Bimini that would make Hemingway proud. Become a character in our 2010 chapter and while your there, write some new history with old friends. The Big Game is On! Dr. Guy Harvey is more than a successful artist, he is also a dedicated ichthyologist and conservationist. 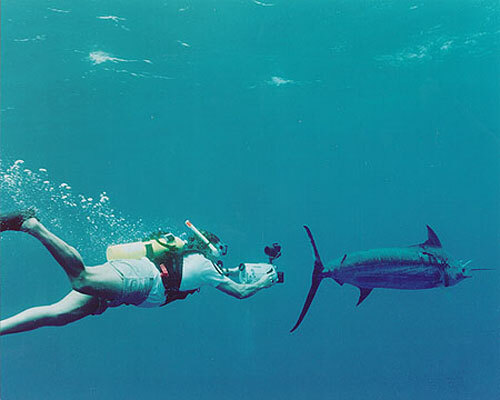 He is filming a marlin in deepwater in this photo. 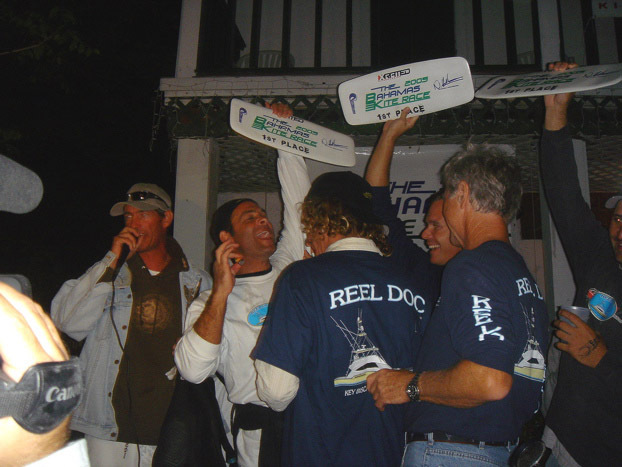 "Guy dedicates much of his talent, time and resources to programs that protect our oceans, fish population and reef systems. The Guy Harvey Research Institute at Nova Southeastern University and The Guy Harvey Ocean Foundation have taken on a leadership role in providing the scientific information necessary to understand and protect the world’s fish resources and biodiversity from continued decline." A demo cut of some intriguing UW footage from Guy. 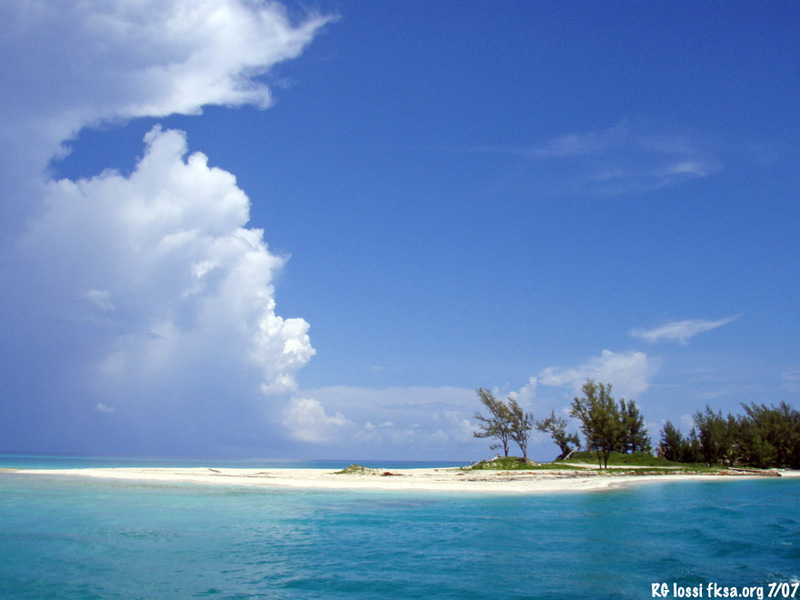 "Bimini is among the closest of the Bahama Islands to reach from Florida. It’s about 50 miles by boat from Miami. “The Guy Harvey Outpost concept is to create an eco-destination attracting both fishing and diving enthusiasts while focusing on adventure travel,” said Chris Pollock, general manager." The second phase of renovations at the old Big Game Club include educational programs, including a Guy Harvey Theater, a guest lecture series and interactive sessions with the Guy Harvey Research Institute at Nova Southeastern University." I first remember staying at the Big Game just after High School. I skipped my graduation to run the family boat as dive and fishing tender to the 109 ft. El Presidente on charter to the Biminis. Stayed there a few years later do shoot the bluefin tuna migration underwater for a BBC documentary. We were even set up to tow a guy at trolling speed within an acrylic faring to shoot tuna hitting baits behind the sportsfisherman. As the wind had the tuna swimming hundreds of feet deep while we were there, spent an untoward time in the Big Game bar downing their famous rum punches prepared by Clayton Powell's girlfriend.. Much later on stopped by a couple of times for conch fritters and drinks after the Ft. Lauderdale to Bimini kitesurfing race. Still lots more trips to Alice Town over the years and the Big Game was always there. Good news, its back again, likely better for Guy Harvey's insight and concept for sustainable fishing and ecotourism. The original Bimini Big Game Club on Kings Highway, Alice Town a stroll down the road towards Weeches and Chalks seaplane ramp. The Big Game Club has a rich history. 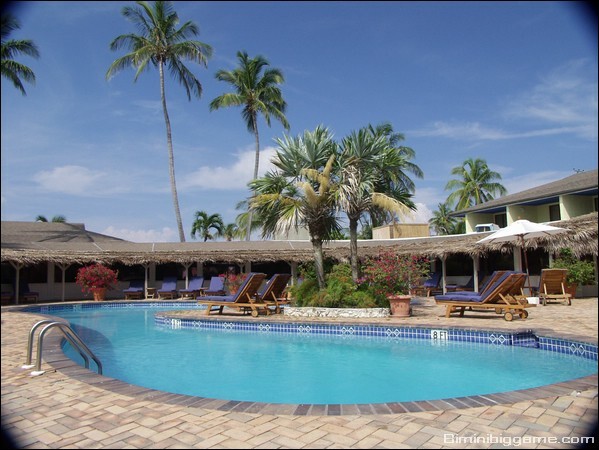 Founded in 1936 and formerly owned by the Bacardi family, the club’s guests have included Ernest Hemingway, Dr. Martin Luther King, Sammy Davis Jr. and Rita Hayworth. Last edited by RickI; 06-15-2010 at 09:54 AM. Bimini has always been about a variety of things to see and do, here's one more! Thanks Guy for bringing the Big Game back!!! As you know I've been over there quite a bit this year. I can say that Bimini seems to be coming back a bit. While I am now spending most of my time on South Bimini, the new Big Game club is very nice! I tried to book for last weekend, but they were sold out. I'm sure that the extra tourists will help the island even in the short term. It's funny to me how few people in S. Florida that have boats have never been to Bimini. It's not your normal resort island, although Bimini Sands, Big Game, and Bimini Bay all cater to higher end clients, but I really like the rustic feel of the island. With a little knowledge and skill, you can hop in the water and feed yourself! The back water kiting is a total adventure if you happen to catch the wind right. I also believe that when the wind is out of the E to SE that Bimini hold much stronger velocity than S. Florida or the upper keys. 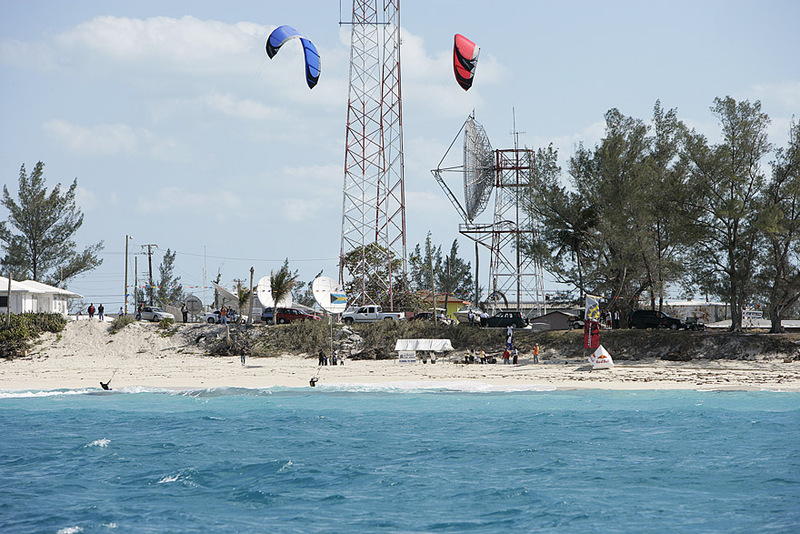 We have Chris Quinn set up on kite beach in Bimini (South end of South Bimini), which is the only beach launch that can be kited in nearly all wind directions. 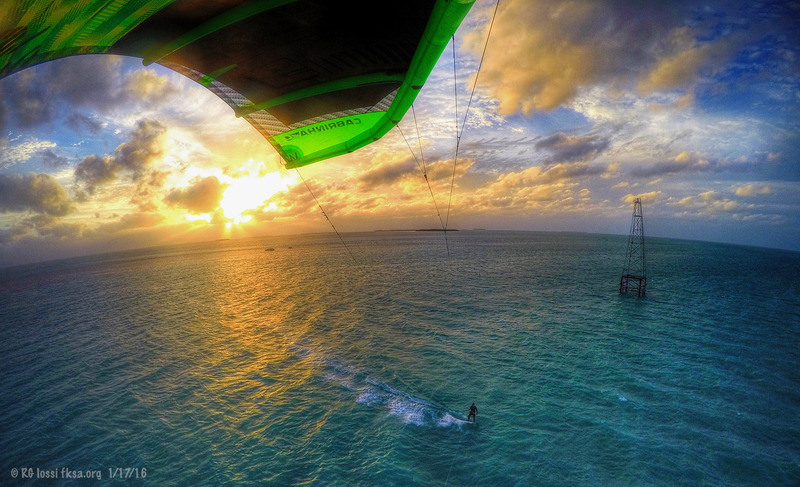 If you are headed over just facebook him at "bimini kiteboarding" and he will show you around. I went over for a day trip on Sunday and got hammered by cold, rain, and storms. We still managed some bugs, hogs, and a mutton. Had a great dinner Monday night. I'll toss some pics up as soon as I can. Looking forward to checking out your photos Kent and thanks for the reports from the Biminis! It really is a rustic place in some respects, that is a favorite part of the place for me too. I recall when a bunch of us ended up at the Big Game after the Ft. Lauderdale to Bimini kite race. Who won that race anyway? As a scientist, artist, and avid sportsman who enjoys diving and fishing, I have had the good fortune of traveling our blue planet for research, work and for fun. Through my travels, I have come to appreciate how small our world is and how much stress is being put upon our irreplaceable marine environment. Every day I have greater appreciation for the challenges that we face in simply understanding the marvels of the marine world and how to conserve these resources for our children and future generations. What I have concluded is we all need to unplug from the computer, pack our gear and get out there. Get really connected to the world. Breaking away is a big decision. Where to go? How long to stay? How do I get the most out of the time away? How do I make sure I have a great time? The questions are numerous; the options are endless. For this reason, I've created The Guy Harvey Outpost Resort concept. Our goal is to create a collection of properties in unique destinations owned and staffed by people who are passionate about their time on, in and around the water. We want to create a recreational product that exemplifies the type of experiences I enjoy in my travels, where each trip is an adventure - an expedition of discovery, with experiences that become memories to last a lifetime. The Bimini Big Game Club is our first Guy Harvey Outpost Resort. Not only does Bimini offer unlimited fishing and diving opportunities, great history and a lot of fun, its home to the Bimini Shark Lab which is doing incredible research work on sharks and the unique marine ecology of the Bimini islands. At Outpost Bimini, we will give you an opportunity to peek inside the world of some truly amazing shark research that is of particular interest to me. 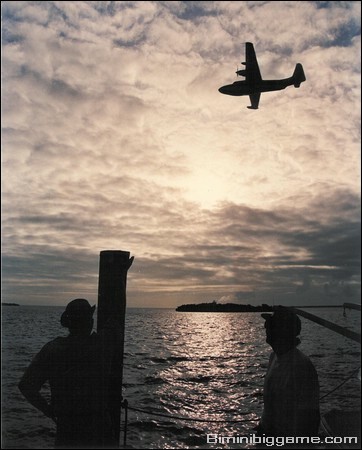 Come to Bimini and be a part of its history. Regardless, just get out there. Hone your skills, learn something new, expand your vision, get really connected to the world. 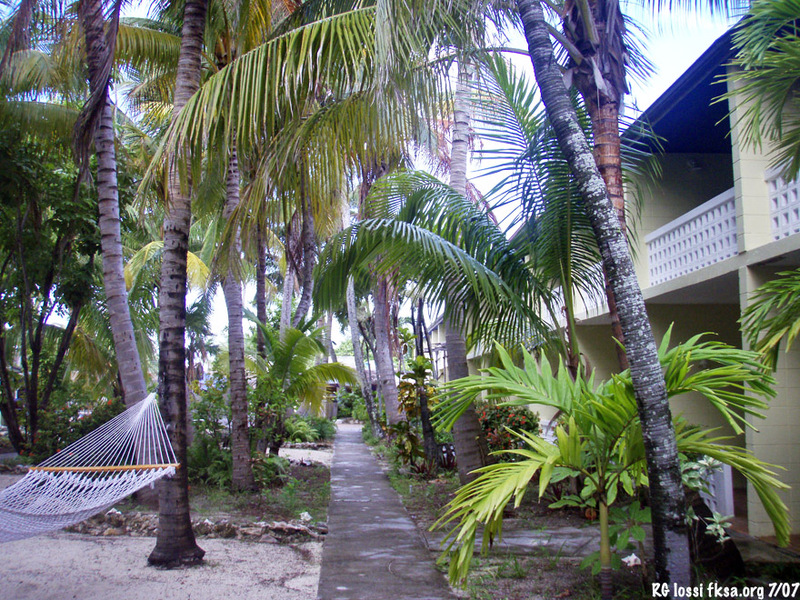 Do that, and you'll find it truly rewarding when its time to simply stretch out in one of our hammocks and relax. As we say at Guy Harvey Outpost, "From the Oceans, Comes Life". Live it to its fullest. Enjoy the journey. Last edited by RickI; 08-11-2010 at 09:10 AM.